BabyLed Food Ltd is a Northumberland based start-up that specialises in the manufacture of new and innovative baby food products. Our spread range is available in mini jar format and contains no artificial preservatives, no added salt or sugars, or anything else that would be considered ‘unhealthy’. We trade mainly online but are now looking to expand nationwide and are on the lookout for distributors and stockists. I set up the BabyLed Food business just over a year ago at Vallum Farm, Northumberland and it has been growing steadily ever since. It initially took us quite a while to get our manufacturing process/premises absolutely right (as of course it needs to be, given we make baby food!) but since those early days we have had nothing but encouraging feedback which is brilliant! We make everything here in our small production kitchen but are hoping to grow fast and get as many people as we can aware of our products!! As you have no doubt seen on our website, we currently make a range of products suitable for babies and toddlers who are going/have gone through the weaning process. They aren’t ‘meals’ as such but are more like spreads or thick sauces, designed to be used with accompaniments to form part of a snack or meal. The six recipes we have are all made from healthy ingredients, with no added salt, preservatives or anything that could be considered ‘unnatural’. These six recipes have been really well received by parents embarking on a baby-led weaning journey, as they allow baby to explore new tastes and textures they may not have previously had the chance to. 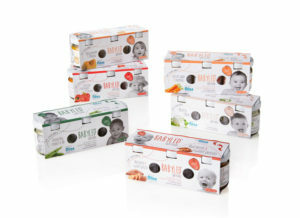 When allowing our children to express themselves with their food choices and use their own hands to decide whether they like/dislike something, or want more or less, we believe this enables a child to become less fussy around food – this is something important to us at BabyLed and is one of the main reasons why I developed the products! I still spoon fed my daughter when I needed to, however, I always felt it was important for her to have more control. I do also, however, want to highlight how useful the products can be for parents of children aged perhaps 1-3 yrs old too. Aside from the convenience of the mini jars, from which you can get enough for a single serving without any wastage or leftovers, the products are just as good for parents who are now experimenting with larger meals for their little ones. My daughter is now 3 and we’ve used the products frequently as a sauce/paste when coating pasta, cous cous, rice etc – and she loves making mini pizzas using our Avocado, Red Pepper and Tomato recipe as a base, tossing lots of cheese and ham on top!! So really I’m looking for lots of new ways to reach out to parents across the UK with young children as we feel these products offer a ‘new’ meal option (other than self-preparation, of course!) other than the likes of Ella’s Kitchen, Cow & Gate etc full ‘meals’ which need to be heated or served in a bowl. We’re looking for lots of mums (& Dads!) like you, able to review & blog about our products in a positive light and share your experience across your website/social media accounts. We hope this will be a fun experience for you as you experiment – I’m happy to send you a jar of all our flavours free of charge for you to taste and play around with new meals! Or if you’ve a younger baby, just let them explore the flavours with a breadstick or two and see what happens! Moving forward, we’re definitely on the lookout for lots of ongoing content for our website (much like My Bump 2 Baby!) concerning feeding/weaning, being a mum generally etc, so it’d be really good if we were able to work together again as the BabyLed business grows! Let me know if this would be of interest too. We’d prefer that a blogger is a mum (or dad) of young children, preferably in the 6 month to 3 year old bracket (though this isn’t a necessity), so as to trial the products and review them fairly. Get to keep the reviewed product.